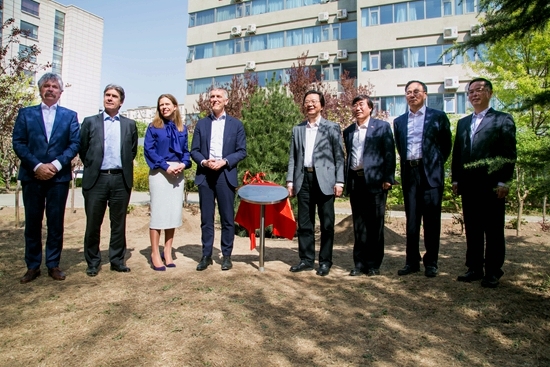 On April 12, a delegation headed by Mrs. Carola Schouten, Deputy Prime Minister and Minister of Agriculture, Nature and Food Quality (LNV) and Arthur Moore, President of the Wageningen University and Research Centre(WUR), Kingdom of the Netherlands paid a visit to the Chinese Academy of Agricultural Sciences (CAAS). Prof. Tang Huajun, Member of the Leading Party Group of Ministry of Agriculture and Rural Affairs and President of CAAS hosted the Dutch guests. The two sides planted together an evergreen tree that symbolizes friendship and cooperation. In his remarks, Prof. Tang Huajun congratulated the guests on the 100th anniversary of WUR. He said that the friendship between the two sides began in the 1990s and has developed a diversified, multi-level and multi-areas cooperation over the years. And three of the cooperation outcomes ranked “first” in bilateral agricultural scientific research cooperation area: CAAS was the first agricultural research agency in China to have engaged in foreign institutions for joint degree programs in agricultural sector and has co-cultivated a large number of agricultural scientific and research personnel since 1997; established the first bilateral agricultural joint laboratory in China, and by far has established five international cooperation platforms in different disciplines; undertook first major international cooperation key project in agriculture supported by Ministry of Science and Technology. The co-results of the “International Potato Genome Sequencing Project” were published in the international leading academic journal Nature, generating significant effect. Prof. Tang Huajun proposed that the two sides should further strengthen cooperation in such areas as food safety, animal waste treatment and environmental protection, smart agriculture, agricultural and rural revitalization policies and personnel training on the basis of existing good cooperation. Mrs. Carola Schouten highly appreciated the friendship between the two parties. She said that the two sides are far on the map, but the cooperation is very close. She hoped that scientists from both sides could get more fresh ideas, guide and motivate more agricultural scientific research units and enterprises for bilateral cooperation. Mr. Mol expressed his great pleasure in planting a tree of friendship in CAAS. He also quoted the Chinese proverb “It takes ten years to grow a tree and a hundred years to bring up a generation of good people.” Both sides wished to use this as a new starting point to deepen scientific research cooperation and cultivate talents in joint efforts. WUR is celebrating its 100th anniversary this year. It plans to plant 100 "friendly cooperation trees" at the premises of its 100 major partners in the world. More than 30 people, including officials and experts from MOA and CAAS relevant institutes, as well as representatives from the Dutch Embassy in China, WUR alumni, attended the event.